A few half-gallon bottles of milk (that we get delivered locally from Lakeview Farms)…we normally order about 7 or 8 bottles at a time and are due for another delivery on Thursday morning. There is also a half-gallon of some local apple cider that we bought on impulse at a little fruit stand up in the N.C. Mountains last weekend. Next shelf down there is a container of homemade applesauce, a couple of figs that are leftover from the farmer’s market, some jars of organic jellies and olives (from Earth Fare), a partially eaten apple, and last, but certainly not least…the chocolate torte recipe which I like to turn into little chocolate powerballs. I can barely go a day or two without eating a couple of these! Next, homemade hummus, some 6-ingredient mayo I found (we are still assessing if we like it), organic heavy cream, a couple of containers of organic sour cream and plain yogurt. I also put a container of some mozzarella cheese balls on this shelf only because the cheese spot was too full! On the bottom shelf there is a bag of homemade flour tortillas (yum! ), leftover homemade whole-wheat noodles from dinner last night (planning to send some of these in my daughter’s lunch this week), leftover apple/sweet potato side item from dinner tonight, and the start of my kindergartner’s lunch for tomorrow (in the little container with the grapes and carrots). The top drawer, which is lovingly known as the “fruit drawer”, has green grapes, a lemon and lime, some local grape tomatoes (yes, tomatoes are actually a fruit not a vegetable), and blueberries. We actually keep most of our fruit in a bowl on the kitchen table, which at the moment happens to be overflowing with bananas, apples, more tomatoes, pears, a mango, and avocado. The next drawer is the vegetable drawer and contains some celery, carrots, herbs, and peppers from our garden and the farmer’s market. We will get another CSA box from Poplar Ridge Farm on Wednesday so I didn’t want to stock up on veggies too much. The bottom drawer is the meat drawer, which remains fairly empty these days. I am actually considering making that the new cheese drawer or something. Anyway, at the moment it has some leftover local Italian sausage from dinner last night and some gumbo that is defrosting from our freezer (for dinner tomorrow). The door contains a variety of things including butter, local eggs, tahini (for making hummus), pimentos, pure maple syrup, orange juice (which I buy in small containers because we can never drink enough before it spoils), cheese!…we love some cheese, mustard, sesame seed butter (which I unsuccessfully tried on my daughter who goes to the nut-free school), capers, red curry paste (which I think might be pretty old because I don’t even remember what it is from), some more jelly (clearly I need to consolidate the jelly jars), fish sauce, and some organic ketchup from before our 100-day pledge. Peppers are a fruit (just like the tomato)! Many “veggies” are botanically fruits like cucumbers and squash. On another note, you’ve inspired me to clean out my fridge. Thanks! So, what do you normally use as sauces/dressings? Like ketchup, mustard, mayo, BBQ sauce, soy sauce and salad dressings? Are you able to find some items in the store that fit the rules, or do you make these things? I am a missionary in Peru, and we can easily find fresh fruits and veggies. However, we don’t have a Whole Foods, or any other grocery store, for that matter, in this area. I’m having a hard time trying to figure out substitutes for these items. Thanks for any help! Now that our real food pledge is over we use ketchup (which contains sugar) in moderation and the least processed organic mayo that I can find in moderation as well. Both of those can be made from scratch though if you google for recipes. We make homemade BBQ and salad dressings from time to time and we were keeping our soy sauce in the pantry, but have not moved it to the fridge. Oops! Eggs should not be stored on the door as it stays too warm there. I know that is crazy as most fridges still have the little built in egg cups! That is crazy. We had the same issue with our milk (which spoiled after being stored in the door). It posted before I was done, sorry! So SunButter is awesome. It is made out of sunflower seeds….thats the only thing in there! My son has a few allergies and so no nuts for him. Thank you for your blog and ALL the info. When we learned of my sons allergies we had to change our eating around and since then the more i learn of whats in our food the more we are leaning towards the “real food”. Thanks so much. Keep up the amazing job!!! I laughed at your comments on everything in a place. I am the same way and constantly giving my husband a tour of the fridge in hopes he will put things back in the correct place. I make my own mayo, mustard, and I am about to try some chipolte ketchup. Since ketchup is so sweet, I am hoping a spicier version will let me cut down on the sugar. way late, but does anyone have a mustard recipe? FYI according to Martha Stewart you should never store dairy or eggs in the door of the refrigerator as it doesn’t stay cold enough. Great blog! Lots of info I’m just trying to get through it all. I know this post is from a long time ago, but I am confused about something–do you eat full fat yogurt, sour cream etc? 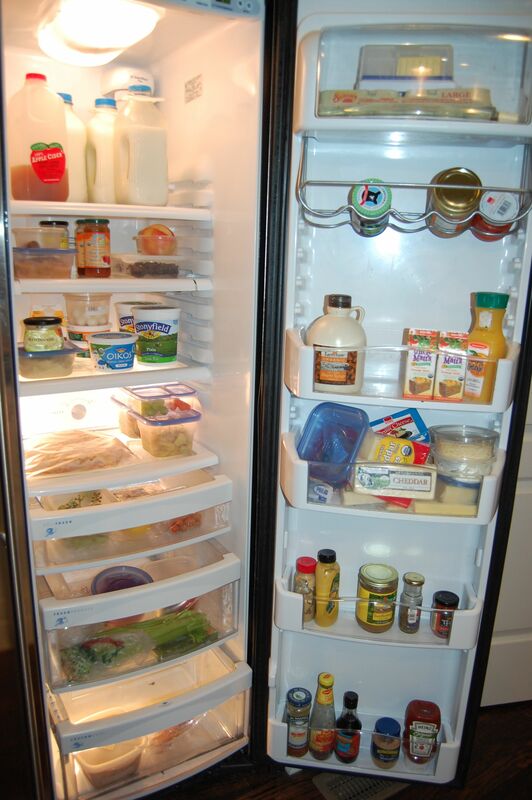 The yogurt in your fridge is non-fat. Thanks! We eat all full fat dairy now…we were a little slower at changing some things. You mentioned that you buy orange juice in small containers so it doesn’t spoil before you get to drink it, but why don’t you just buy oranges and juice them yourself? My family and I have never bought bottled orange juice, but we’ve had the same citrus juicer (similar to this one: http://www.amazon.com/Juiceman-JCJ150S-40-Watt-Automatic-Juicing/dp/B004T0BJIO/ref=sr_1_4?s=kitchen&ie=UTF8&qid=1358203428&sr=1-4&keywords=citrus+juicer) for over ten years. Quick question… why local meats? I understand why it needs to be organic and free range but why is local important? Would local be your state or only the city in which you live? Hi. What kind of jelly to you buy? I typically buy Trader Joe’s organic grape, boysenberry, blackberry, and/or raspberry… Are these okay? I cannot find a blog that addresses jelly! Also, I’ve been reading your blogs, and I’m completely on board! However, I have two teenage boys who play high school football – they are trying to GAIN muscle and weight! Do you have any suggestions for feeding two young men who are burning thousands of calories/day working out? I second the question about Jelly. My Mom is trying to completely change hers and my dad’s (he has carcinoid cancer) eating habits to all organic/almost vegan diet. I keep telling her to come here and check stuff out, and she will, but we couldn’t find a jelly in the store that *quite fit the rules. I am also wondering about the jelly. I see that you post “all-fruit kind” but I haven’t been able to find a jelly that does not contain sugar. Is there a brand you recommend? Simply Orange is a terrible substitute for orange juice. The process by which they juice and for how long they engineer their juice to last- it’s just not worth it. Kind of off topic, but I love the layout of this fridge! What brand/model is it? Nichole – It’s a 2007 GE Monogram, which I think has the same interior as the GE Profile. I noticed in an earlier post that you used Homestead Creamery milk. Above it seems that you switched to Lakeview Farms milk. I live in the area and am trying to decide on my milk source as well. I was wondering the reason for your switch? Thank you for the abundance of your information and your transparency!